I only have a few more pages to read and I am finished with this book. It was great! 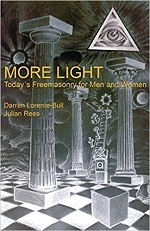 I am very happy to add it to the other two co-masonic books I have in my library. I find On Holy Ground quite a bit better, but Rees’ book is more about the UK. Your right! I have On Holy Ground too. I should reread it when I have the time. I am not a mason but I like reading about the different co-masonic orders. I have looked at all the different co-masonic orders on this website and the female order. Looking for the right fit for me. There is only one order that I am little wary of and that’s Grand Lodge Ancient Universal Mysteries. It will be a while before I can join a lodge but finishing my education it important and there is no lodge near me. I do have question about co-masonry and female masonry. Are some groups more spiritual and esoteric than others?